THE RESTORE NEEDS YOUR HELP! 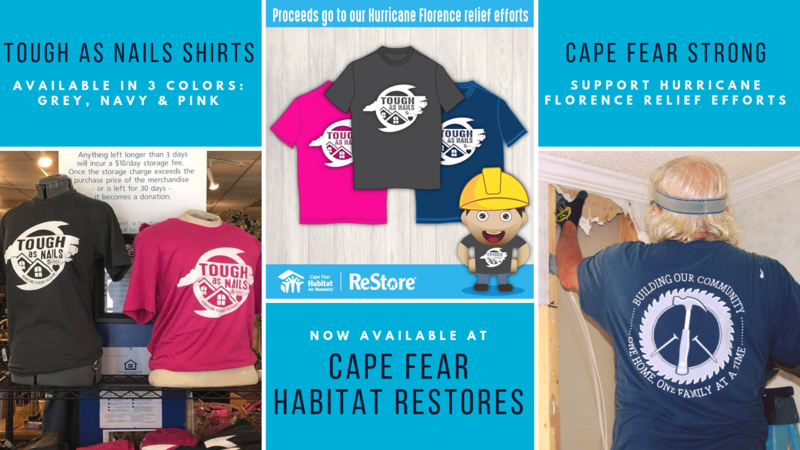 Cape Fear Habitat ReStore is dedicated to helping our community rebuild after the devastating effects of Hurricane Florence and we need your help! We are in need of supplies and donations to help our community rebuild. Furniture, appliances, building supplies and home goods – Every donation makes a difference! Donations can be dropped off at all 3 Cape Fear Habitat ReStore locations or picked up for free by calling our Donations Hotline at 910-686-9800. Every ReStore purchase supports the mission of Cape Fear Habitat by providing affordable access to household goods and supplies while protecting the environment from items being sent to the landfill. All donated items are recycled and sold for 50 to 80% BELOW retail! Visit the links below to discover how you can donate, volunteer, be informed of surprise sales, and more!